Fall Creek Veterinary | Indianapolis Fishers Veterinarian | Dr. Jerry Risser - "Grain Free or Not Grain Free: That Is the Question!" "Grain Free or Not Grain Free: That Is the Question!" One of the routine questions asked during each patient physical is usually, “what are you feeding currently?” Seems innocent enough. Some clients are sheepish (not great food, they fear), some don’t have a clue (their spouse or someone else buys it and they just scoop kibble) and some are quite proud of their choice. “Grain-free” is one about which people are proud, because there’s so much out there advocating it. But is it a good idea for dogs? How about cats? Let me start by qualifying a few things. First, there are a lot of good choices for pet food out there. There are foods I have never heard about, and most of them are probably pretty good. Much of what we see in animal nutrition spills over from human medicine. We do see a reasonable number of people with diseases like celiac disease, which can arise from an adverse reaction to gluten, a protein originating from grains. But we don’t really see an identical disease in dogs and cats. It is true that any protein can cause an adverse or allergic reaction in a sensitive pet…so-called “food allergies” are a subject best left for another time. But grains in general (and gluten specifically) are quite rare allergens. I contend that for the majority of dogs, grain-free diets are unnecessary. The wild dogs from whom our current pups descended are “omnivores,” eating meat, grains, vegetables, even grass (which is part of why that fresh green spring grass can be such a delicacy). We have many years of excellent research from several companies that have created diets that have genuinely extended the lives of pets. My desire isn’t to insult any well-meaning person who is seeking to take excellent care of their dog, but I’m convinced that the “grain-free” trend is a fad. So, while a “grain-free” food likely won’t hurt anything for your dog (though that may not be true; the next post will look at a possible link to heart disease), it may just be an added expense and hassle for the human companions of most dogs. I don’t disagree that some dogs have done better, whether that means better digestion or freedom from skin signs, because of these diets. But for most, they’re unnecessary. What about cats? That, too, is the subject for another post! 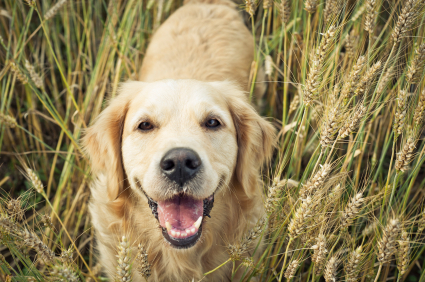 There is a great deal of buzz about "grain-free" diets for dogs right now. Is it hype, or solid science. Dr. Jerry Risser looks at the question in this post.